their way. Despite a total sense of self-deprecation, they manage to attract a small but loyal following, only to break up when their guitarist/singer, Jamie Williams, moves to London. A year later, a tiny Midwestern record label executive rediscovers the band when he mistakenly receives a compilation CD in the mail. He desperately tries to contact one of the band's members, but to no avail. 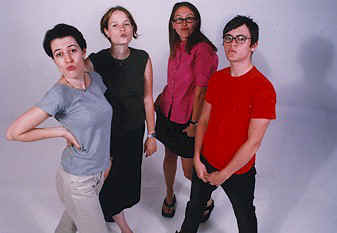 Finally, one of the girls (Jenn) returns his e-mail, and through a number of Internet interactions, he discovers that a CD's-worth of unreleased material was recorded just before the band broke up. He knows he must release the songs on his record label, no matter the cost! After a series of light-hearted mishaps, the CD finally goes to press, when suddenly, Jamie returns from London! Will the band get back together? Can it be like old times? Could this CD be the one that makes them Great Big Rock Stars? It sounded even more like a television series when Urinine Records' owner Sid Sowder told me the Park Ave. story over the phone from his office in Kansas City. Sowder, a 27-year-old Internet wonderboy, runs Urinine "as an expensive hobby, like golf," putting his money and time into releasing CDs by 22 bands, including The Believe It or Nots, Hell on Wheels, The Hillary Step and Free Range Pilgrim. He calls his work with Park Ave. "a labor of love." "I found out about Park Ave. about the same time as every else: too late," he said. He said when he heard their songs on a Saddle Creek Records compilation -- forwarded from his old job as a music director at a community radio station in Indianapolis -- "he fell in love immediately." "I contacted Saddle Creek and asked if I could get in touch with them. Nothing happened, then finally I got an e-mail from Jenn Bernard, the band's keyboardist. She told me they had broken up." Desperate, Sowder asked if there were any unreleased Park Ave. tracks. "I told him that we had a crappy 4-track recording that we put down right before Jamie left," Bernard said. "We recorded it for ourselves. We felt we had a really good group of songs that we all liked and that we should get them recorded before Jamie left." "When we first started playing, we were too scared to sing into the mics at practice." Without even hearing the tapes, Sowder said he wanted to release them. "She said the quality wasn't good enough and tried to talk me out of it," he said, "but I convinced her to let me hear the tapes." We Broke Up, nine songs that capture Park Ave.'s infectious, homemade pop-rock sound, warts and all. Tracks like "All Boys Band" and "It's a Life" are sloppy, post-punk rock tunes, with warbly, unsure vocals, slightly awkward instruments, and unmistakable, hook-filled pop melodies. The final mix by Mike Mogis captures the band's unpretentious honesty in all its low-fi glory. Park Ave. formed in January '96, when teen-agers Clark Baechle (current drummer for The Faint) and Conor Oberst (guitarist/vocalist, a.k.a. Bright Eyes) decided to trade instruments and form a band. "Neely (Jenkins, the band's bassist), Jamie and I were all sophomores and juniors in college," Bernard said. "Conor was 15 and Clark was 14. We had friends in common and just ended up talking to each other. I think they were both itching to do something different. "We were starting from scratch, none of us knew how to play instruments," she said. "It was difficult for everyone. I had taken piano lessons when I was younger; Jamie and Clark had messed around on guitar. Throughout the whole thing, we never owned our own equipment. When we first started playing, we were too scared to sing into the mics at practice. We got over it by encouraging each other." Weekly practices were often ditched for trips to the mall or communal naps. When they were approached by a promoter to play a show at Chicago's Fireside Bowl, they were miffed, Sowder said in the band bio, adding that Conor tried to talk the promoter out of it by telling him they weren't good enough. Sowder's band bio also hints at romance between band members. "We got along remarkably well, although I think we learned a lot about how males and females interact," Bernard said. "The funny thing about the bio -- we were sitting around reminiscing about all the fun, crazy stuff, and some things got exaggerated. When Sid wrote the bio, he didn't get the realities of having to practice one song for four hours because it was so hard for us to get it right." Over the years, Park Ave. released a split 7" with The Wrens and were included in the Saddle Creek compilation, but that's about it for recordings. Bernard said they played live 10 or 15 times. "We never heard anything from record labels," she said. "It was really fun for us just to see how much our friends enjoyed it, but we weren't really into making it a career. " After Jamie went to London to work in art, Bernard and Jenkins went onto teach high school, while Oberst received national acclaim for his work as Bright Eyes, continuing to tour this summer. Baechle's band, The Faint, also continues to record and perform. "We got along remarkably well, although I think we learned a lot about how males and females interact." "Everything I do is a money loser." But what about Park Ave.? Could the CD, slated for release later this month, change the band's fortune? Jamie has since moved back from London, with plans to live in Omaha for at least a year. Bernard said a reunion for the CD release isn't out of the question, though there are no plans to permanently reform the band. "We couldn't tour, except in the summertime," she said. "My little brother asked if we would get back together if someone gave us a bunch of money. I said we would if we made a million dollars and were promised $5 million more." Sowder said unlike the majority of acts who record on his label, Park Ave.'s music is widely accessible to anyone who likes pop music. Still, he doesn't expect the CD to break any sales records. "Everything I do is a money loser," he said. "I hope that it'll go big; I believe it's a good record or I wouldn't be putting it out. But I'm also a realist and know that I have fairly unique tastes." Plus, it's tough to sell a band that's no longer together. "How much promotional push is really going to help them," he asked, "especially when they won't tour or promote themselves? I want to get the CD out to college radio and the press and hopefully the music will be enough to take on a life of its own." Printed in The Reader August 5, 1999.